I'm not the best decorator, designer, or photographer, my socks have probably only matched twice in my life, and my cats are rather plump. I'm far from perfect, but one area I'm getting pretty good at is paint. Jesse has definitely witnessed several 'I JUST RUINED IT!!!!' 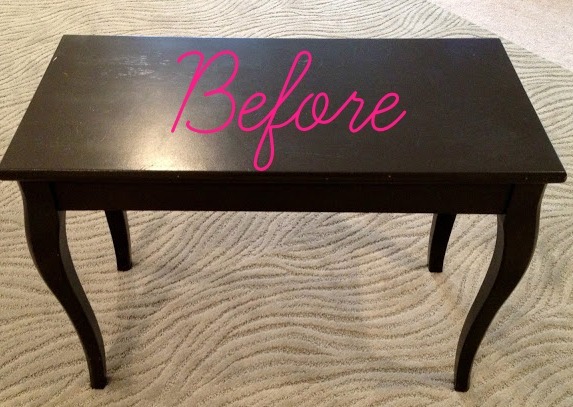 mini-breakdowns after one of my furniture makeovers has gone awry, but my goal has always been progress over perfection. After painting probably 20 pieces of furniture in the past few years, I've definitely made some progress in my painting skills. 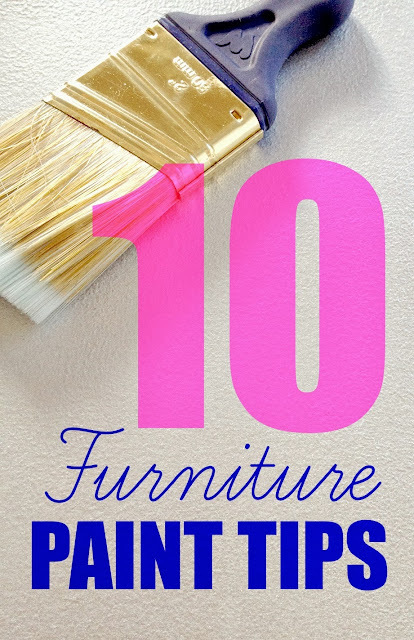 So, today, I thought I would roundup 10 of my favorite painted furniture makeovers, and then afterwards answer some of the FAQ's I get about painting furniture. Let's get started with my 10 favorite furniture makeovers, going in chronological order. I'll share some failures, some successes, and what I've ultimately learned along the way. This was the absolute first piece of furniture I ever painted. I did an awful job. I didn't prime or sand it, and it's basically a giant piece of string cheese now. I'm showing you this for two reasons. One, because I'm about to strip this piece and redo it, and now you can say you knew it back when. Two, because it's a great reminder. A great reminder that if you make a mistake, even on your grandmother's fine antique furniture, you will live to tell the tale. It's not the end of the world. Leave it alone for a bit (bit = three years) and circle back around. 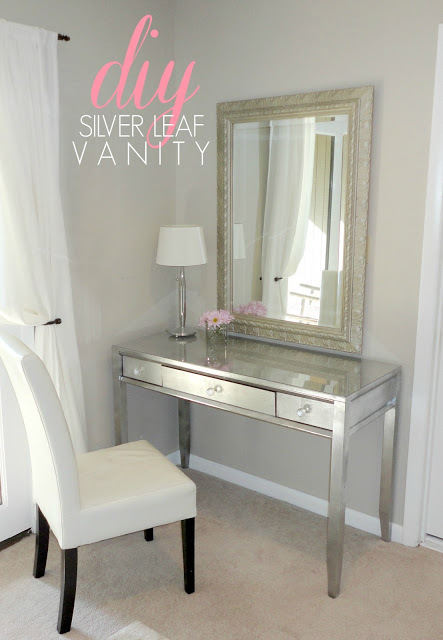 This little vanity table was one of my first furniture makeovers as well. 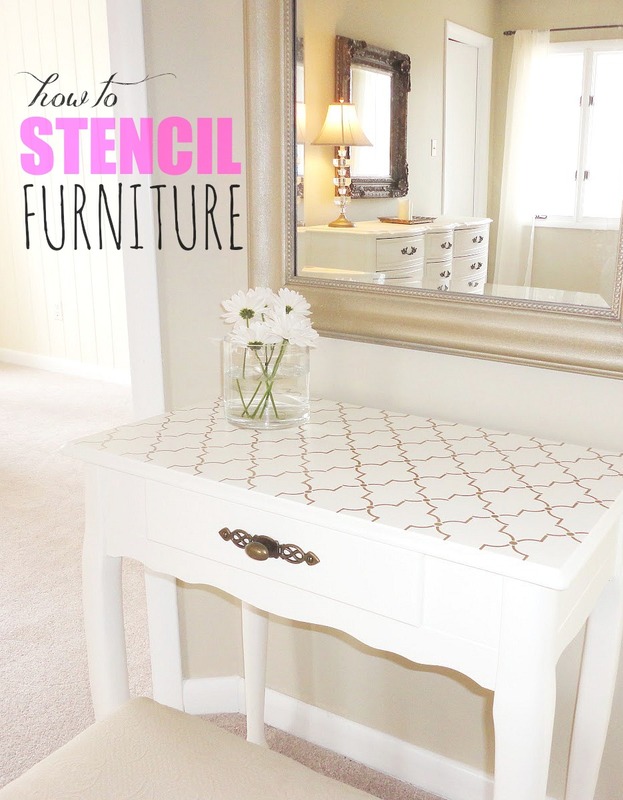 I painted it and stenciled a gold lattice stencil on top. I've since sold it on Craigslist (tips here), but it still holds a special place in my heart. For being one of the first makeovers, I totally think this one came out pretty cool. High five, little guy. So sorry I sold you. 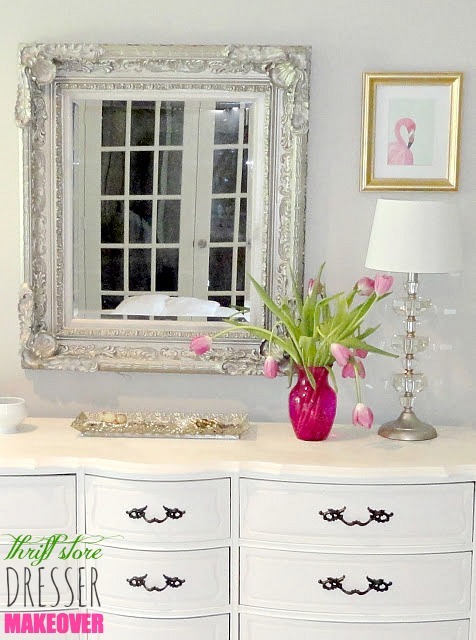 To see the stenciled vanity before pics go here. Oh, the desk. I'm sitting at this desk right now as I write. I love this desk. It's one of my favorites. I love it because it turned out amazing, but only after a lot of heartache. There is some definite truth behind the saying that you learn more from your failures than from success. I painted this table twice, and scraped the paint off twice. Then I cried twice. Then, I finally figured out the most durable solution, which was using an oil based paint and primer. I'll elaborate more on oil based vs. water based at the end of this post. 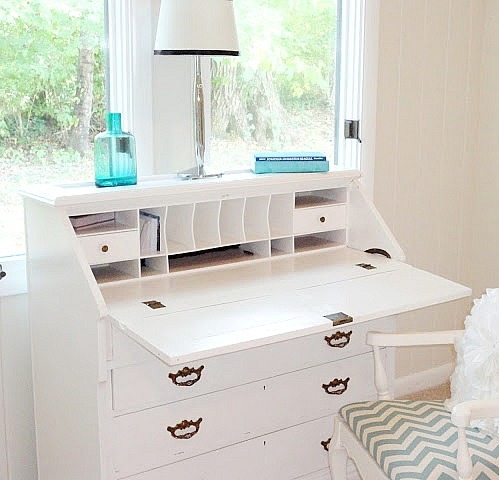 To see the before pics of the desk, go here. #4. 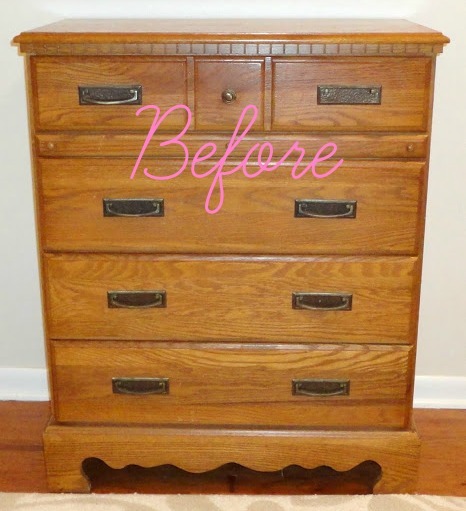 The Dresser Makeover That Launched It All. 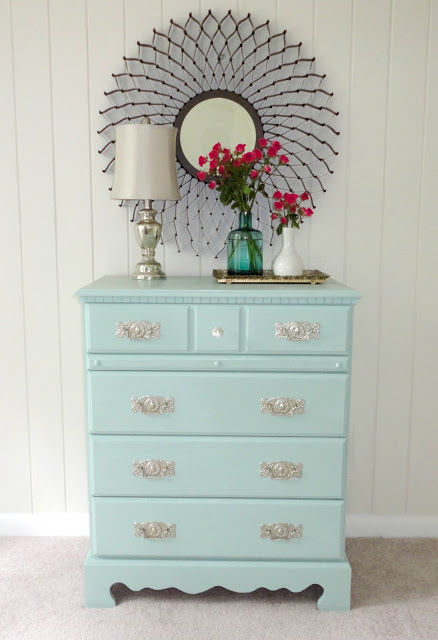 This was the first dresser I ever owned as an 'adult', and I eventually decided to paint it, even after the debacle with the heirloom. As fate would have it, it turned out so great that it sent me into a tailspin of painting everything in sight and eventually starting a blog about my adventures. 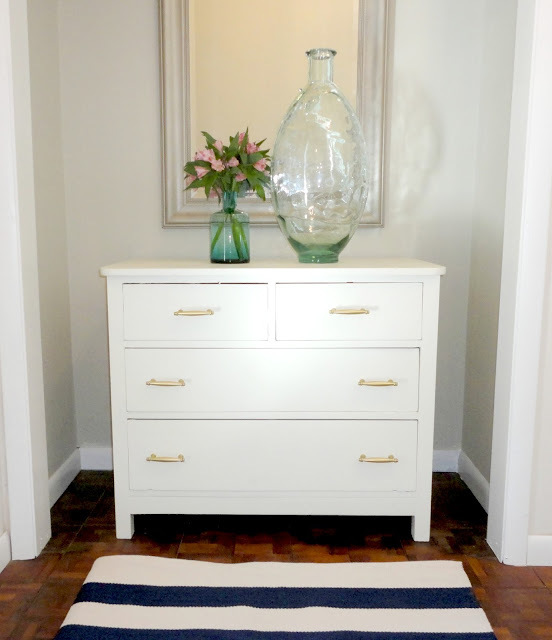 You can see where this dresser recently ended up AND help me with some future flooring decisions here. Seriously, help. 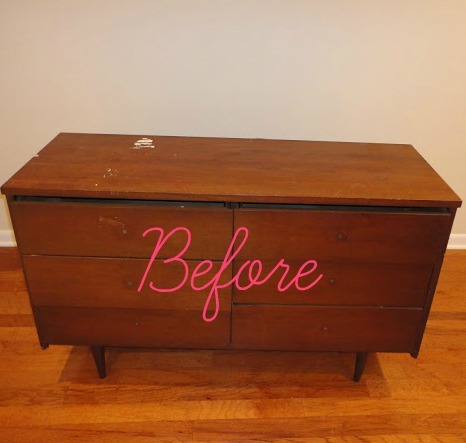 This is the filet mignon of dressers...as in, it's my favorite. Also, it was originally $50, so it's just biding its time before I trade it in for a steak. Kidding. I would NEVER. If you've never seen the before picture go here. This little file cabinet was my first ever roadkill transformation, and I'm hoping it won't be my last. I will never be too proud to drag someone else's trash across the street. Even if it's my own neighbor's, and I totally get stuck in the middle of the street because I overestimate my strength. #7. Piano bench turned STRIPE. 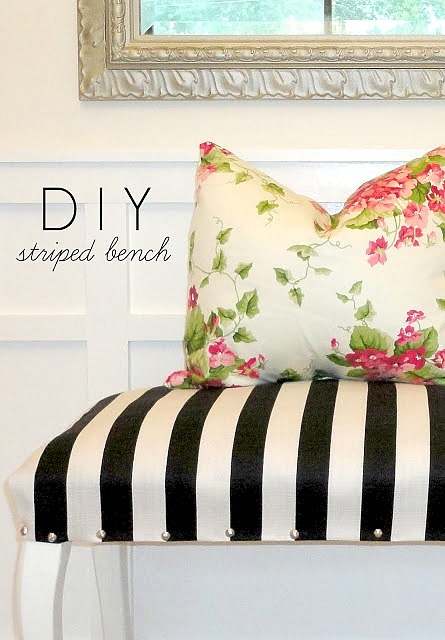 I'm not including any chairs since I've already listed my top 10 chair makeovers here, but this bench is just begging to make the cut, especially after holding his own in the closet makeover. And I can't argue with that. So an exception we shall make. 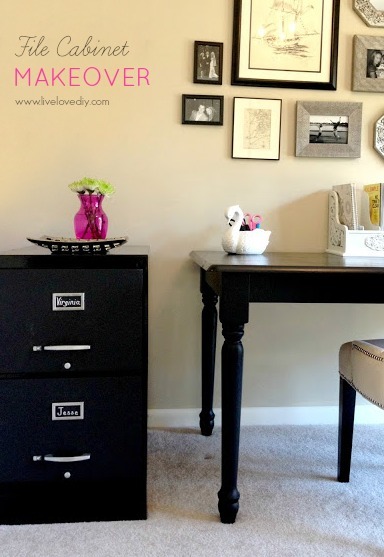 I mostly took a break from painting furniture to paint our trim and our cabinetry throughout the house, and when I came back to it, I had really learned so much. My painting skills really started to improve by the time this makeover came around. I started out with an old dresser given to us by a friend. It was in great shape, but needed some updating. 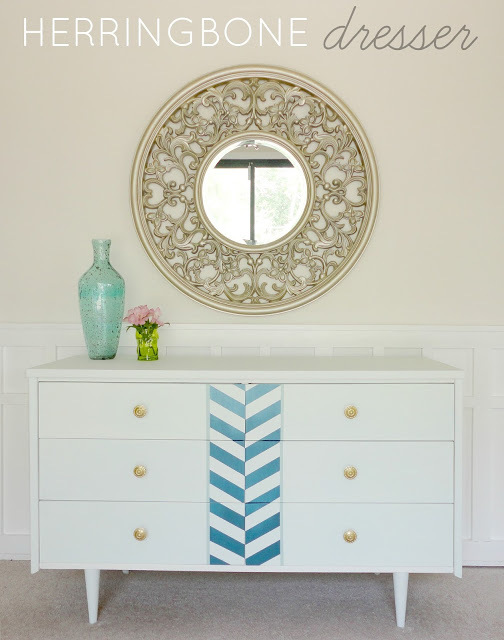 I used my favorite color of aqua blue paint and some fancy new hardware to completely transform this dresser into something that looks amazing in our master bedroom. See the full tutorial, hardware source, and paint colors here. This is one of my most recent makeovers. For this makeover, I decided to do something a little different and throw some pattern into the mix. Here's the before picture of Kevin*. *(who will be forever called that after this post). And here he is after some fresh new blue paint and gold spray painted hardware. You can also see Kevin in his early days back when I first painted and stenciled him and made him be our TV console for 2 years. He's since been relieved of his duties. *Update: Kevin lives on in this post even though we tried desperately to go our separate ways. And after a grueling session with 50 sheets of silver leaf, I ended up with a lovely place to sit and get ready each day. I also learned something cool about plexiglass during this makeover, so I give it an overall thumbs up. It wasn't easy, but I still learned so much. so accidental disco = awesome. Or something. See the entire silver leaf adventure here. And those are my 10 favorite furniture makeovers so far. I'm sure there will be many more to come. 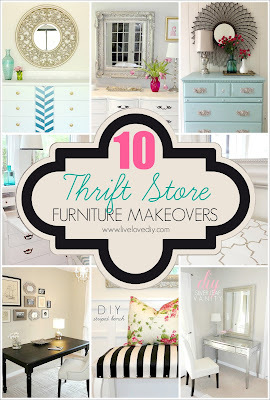 Now, let's answer some of the frequently asked questions that I get after posting my furniture makeovers. Hopefully this will answer some of your questions, too. The answer is that you can use either one. Their are pros and cons of both. Latex dries faster and is easier to clean up, but it's not as durable as an oil-based paint. For something like my desk, I chose an oil based primer and oil based paint because it gives you a really hard, durable glossy finish. With the exception of my desk and a couple of other small projects, I usually opt for latex. It is durable enough for what I need, it can be cleaned up with water, and it isn't smelly like an oil-based paint. That stuff lingers. Emphasis on the lingers. For most of my furniture, I've simply used a flat interior paint in the color of my choice, usually Behr or Valspar. Then, I use a topcoat of my choice. I always prime first, then I usually paint with flat paint, then seal with a wax or polycrylic. Wax is less durable but gives it a softer/matte look. Polycrylic is more durable and can be bought in satin, semi-gloss, or gloss finish. I only use Polyurethane on furniture I've painted a dark color. It's super durable, but it yellows overtime, so it's not ideal for light colored furniture. My preferred method is polycrylic. Wiping the insides of drawers out with vinegar can help remove any old smells. If that doesn't help, wipe down the drawers and then paint them. 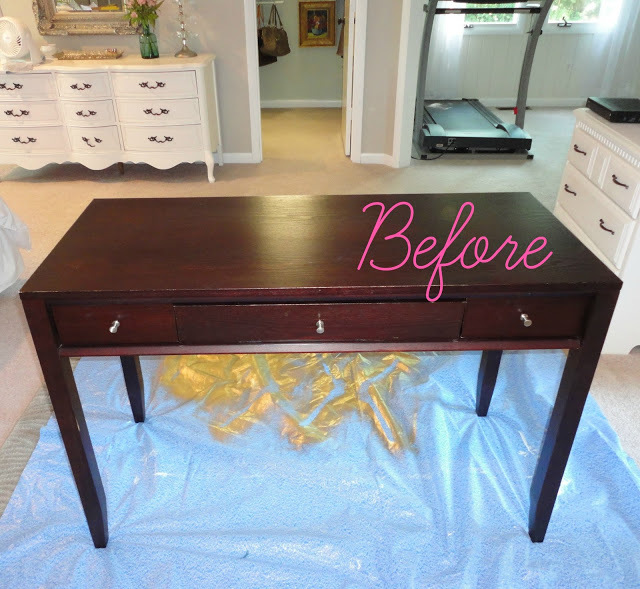 I did that on this dresser, and it smells and looks brand new. I use wood filler (affiliate link) on any dents or scratches. Just smooth a small amount over the dent, let dry, then sand until the excess is removed. Once painted, you won't see any of the imperfections. I do this to almost every piece I paint. I usually use a high quality brush followed by a small foam roller (as mentioned in this tutorial), but I've recently discovered a great new tip that I am loving! 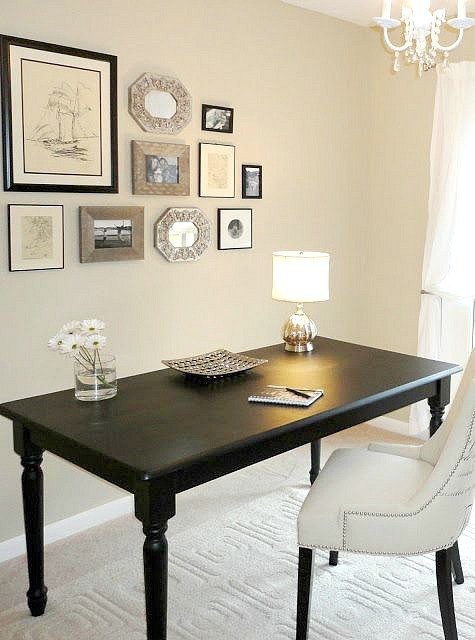 When using latex paint, you can use a product called Floetrol (affiliate link). You add a few tablespoons to your paint and it's basically like a conditioner for your paint that leaves barely any brushstrokes behind. It's kinda awesome, and I can already tell that I'll be using it a lot going forward. More on that later. If you want to swap a knob for a pull, or vice versa, remove with a screwdriver, and just fill in the current holes with wood filler and drill new ones wherever you want your new hardware to go. Once painted, you'll never know the old holes were there. Easy answer. Nope. Sanding a piece first will always give you better adhesion, but these days I usually just prime it using a primer like Zinsser (affiliate link). It holds up really well. And that, sweet friends, is all for today!